A young teacher with an impressive resume takes a job teaching natural sciences at a village grammar school. He makes acquaintance with a woman and her 17-year old son. The teacher has no romantic interest in the woman but that doesn’t stop them from forming a friendship. One day, the teacher’s ex-boyfriend comes to visit. The ex-boyfriend quickly realizes that nobody in the village knows that the teacher is gay. He also realizes that the teacher harbors a secret affection for the 17-year old boy. His jealous actions set in motion a series of events that tests the inner strength and compassion of the teacher, the woman and her son. 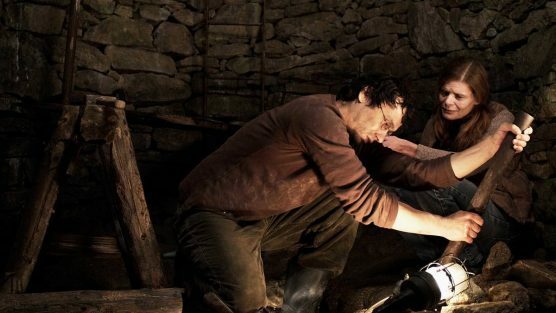 „A Country Teacher“ came about as a co-production between Czech production company Negativ, Pallas Film GmbH from Germany, the French firm Why Not Productions, and the Paris-based international sales company Wild Bunch. What was it like to have so many partners? I’m grateful for our international partners. Without them, the film couldn’t have come about. It also gives one more confidence. It reinforces the belief that our film will find an international audience. The film is full of long takes which concentrate on the characters and their environment. For me, this is the most natural method of filming. I have a deadly fear of cutting in the middle of a scene. In an uninterrupted shot, you get a huge accumulation of emotion and energy from the situation, and this is what really works for me. Of course, that means every shot is a battle because any one little mistake wastes the efforts of everyone. Such a method requires amazing timing on the set. The whole crew and all the actors must hold their concentration for the entire time. Often, it takes you to the brink of what’s possible, which can be uncomfortable, but the joy when that shot goes off just right is massive. Did you write the parts with particular actors in mind? I have been in love with Zuzana Bydzovska for a long time and have wanted to work with her. The character of Marie, who Zuzana plays, is a strong person who holds together the story’s sense. I often thought of Zuzana when I was writing and needed inspiration. I was secretly drawing strength from her in order to be able to continue writing. With Liska, we’d worked together on my previous two features. I know his acting potential is huge but all the same, it surprised me in rehearsals that he played his character in a way very different than he has done before. For the entire shooting period he was absolutely concentrated, he really turned into the teacher and gave that character the truth and depth which I badly wanted it to have. Which scene was for you, as a director, the most difficult? In the film there’s a scene in which the teacher can’t resist his longing, breaks a taboo and attempts to have sexual contact with the teen-age boy, who’s asleep at the time. I came to realize that the film would stand or fall based on the effectiveness of this scene. If done badly, the whole film would be bad and nothing would save it. As we shot the scene I a great sense of relieve settled over me because I could see that it was working, that it was convincing, tender and cruel all at once. Do you make your films with Czech or world audiences in mind? It’s important for Czech film that we filmmakers find themes which speak not just to our local population but also to international audiences as well. As regards our film specifically, it is defined by an emotional problem. In the realm of emotions man is in universally human territory. Unrequited love hurts no matter where you live. Could you tell where does the movie come from? What was the starting point of the writing ? What attracted you in this specific story? A friend of mine told me about a love he had for a heterosexual man and the pain he felt when he realized that this love could never be returned. I also know a woman who had fallen in love with a man who was gay and she too suffered pain from the fact that her love cold not be returned. From these stories I developed the main situation in COUNTRY TEACHER: a woman hopelessly in love with a man who is hopelessly in love with her son. Where is the action set? I mean, how far from Praha ? Could you develope on the opposition between city and country? Six years ago I moved from Prague to a small village about ninety kilometers away. That beautiful natural environment and the open, honest people there inspired me to make a film set against this backdrop. The moment I thought of the idea of COUNTRY TEACHER I knew it had to be set in this region. I’m happy there exists both cities and the countryside. It’s like yin and yang. You need both to be complete. Nature is very beautiful, and very beautifully shot in the film. How did you work on that, and what symbolic role does play the nature in the film: it seems the more beautiful it is, the more tormented the character are! I wanted to create the most exquisite images of nature in order to contrast them with the tragic situation of the characters. No matter our problems, around us is always the beauty of creation and it’s in this beauty that we can find reasons to deepen our consciousness further. What brings to the story (and to the characters who live near them) the strong presence of animals? Of course, the lesson about the snail is important. What does it mean? I have learned over the course of my life that the difference between man and animals is very small. For three years I tended to a herd of horses. In this time I observed all the horses and I noticed how important it is for each horse to be a part of this bigger group, this community. Man is the same way. We need other people because it’s only in one’s positive relations with others that we find happiness. 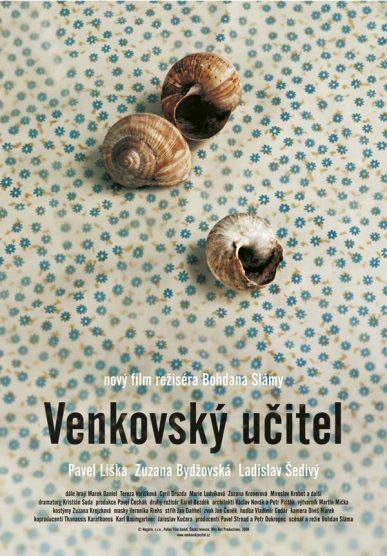 As for the snails, I think people should watch the film to decide for themselves what they mean. More precisely, could you develop the symbol of the bees : giving up their sexuality while working together, is this the final situation of the characters ? I think the teacher says it best when he points out to the students that every creature has its purpose and fulfilling that purpose is the greatest gift any individual can give to the whole. How would you describe the hero’s relation with his parents ? Are they common Czech intellectuals? Every intellectual is unique. Just as every heterosexual, homosexual, sinner or priest is unique. This is the beauty of diversity, which we must handle with care. The teacher must come to understand his parents’ uniqueness just as they must come to understand his. This is a universal family issue. There is something very sad about the characters, confronted with loneliness. As if each of them (and of us) would be by nature alone, longing with connections with others… And at the same time, nearly every character turn down a love that is offered to him… Is that your view of humanity? It happens in live that great love doesn’t come along. But the hero in the film isn’t looking for that great love. What he really wants is a deep and abiding friendship. And I believe that such friendship is a form of love and every form of love has absolute value. Is there a message in this film you specially wanted to bring to the audience? Is the film making a statement about prejudices against homosexuality? This is a story of searching for lobr that has no bearings in regard to sexual orientation. When Petr « rapes » Lada, do you think he expects the boy to love him – or simply to stay asleep ? Was this scene central in the screenplay? The teacher doesn’t expect anything from the boy. He is infatuated with him and in that moment when he has physical contact with him, he isn’t thinking about anything. It’s not possible to say it’s the “central” moment because every moment builds upon the one before, so the moment with the boy wouldn’t exist without everything that came before it. Could you tell us a bit more about the four main actors (I include young Bara)? Are they well known in Czech Republic? Pavel Liska (the teacher Petr) is very well known in Czech Republic. He has been the star in all my feature films. Zuzana (the mother Maria) is a very well know theater actress. She hadn’t worked in film for a long time so this was a kind of “come-back” role for her. I actually wrote the part of the mother for her because I was absolutely taken by her theater performances. Lada, the boy, actually isn’t an actor. We tested more than 2,000 young men and he was the one who fit the character best. Tereza (Bara, the boy’s girlfriend) was an up-and-coming star in Czech cinema and we were lucky enough to catch her before she became totally known. How did you work with Pavel Liska? There is a kind melancholy in his acting : is that what you asked from him? What did he personally bring to the character? As I’ve mentioned, Pavel has been the main character in my two previous feature films. However, I didn’t think at first that he would be right for the role of the teacher. At the same time, after working with him so closely, I knew in my heart that he had the potential to play a more difficult role than I had ever given him. And I was absolutely fascinated watching him become the teacher exactly the way I had envisioned it. The whole process was more emotional than rational. We tried to shoot a film about intimate, personal things, the kind of things that are similar everywhere, wherever people live. Looking for love is a never-ending battle which defines and forms man, an essence within every story, and unrequited love hurts no matter where you live, whatever your geographical location, it hurts the same everywhere. In this story, there are three main characters, each of whom has a fissure in their lives, a fissure to do with love. Marie is in love with the teacher, the teacher is in love with her son who, in his turn, is being dropped by his first love. In such a chain of unrequited love our characters don’t have a chance to find any kind of fulfillment, and it is this they must set aright. Love has many forms, as many as there are people, and every piece of a relationship between one person and another has absolute value in itself. Recognizing this value is difficult because it asks us to accept even that which we don’t always understand, to forgive even when we feel betrayed. Our characters may not find romantic love per se, but they can find a deeper friendship and they can grow from this. If someone is to mature, he must be capable of forgiving. The ability to forgive is one of man’s greatest faculties. The ability to forgive restores faith in the meaning of life.